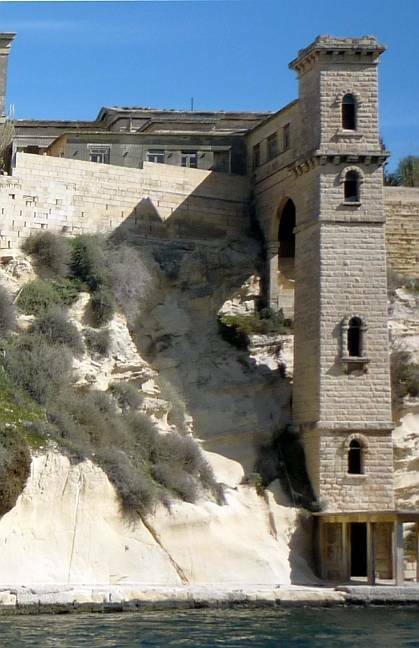 Left to right: (a) End of the West Wing of the former Royal Naval Hospital on the promontory above the Grand Harbour, Malta, part of the conversion of Villa Bighi by Colonel George Whitmore of the Royal Engineers, and others, 1830-32 (see "History (Villa Bighi)." (b) Cot lift to the west of this wing, for taking patients up from the ships, added in the very early twentieth century. (c) The Mosta Dome, by Giorgio Grognet de Vasse, 1833-60, with thanks to Väsk at Wikimedia Commons. 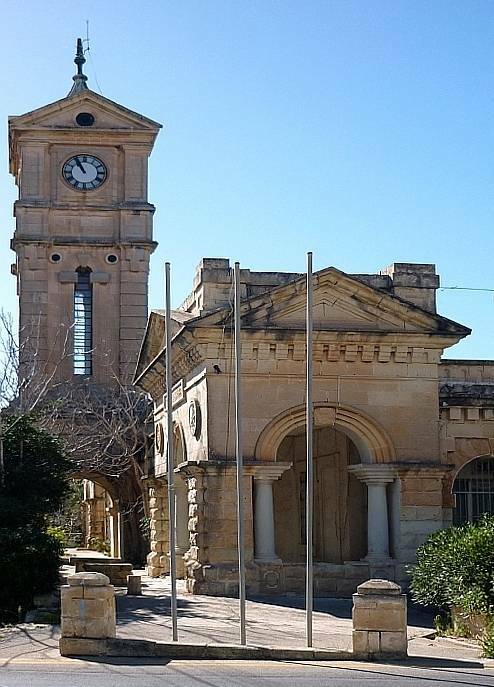 (d) Holy Trinity Anglican Church, Rudolph Street, Sliema, 1866, by kind permission of historian Tony Terribile. Such works as the new portico added to the Main Guard, the prominent buildings by William Scamp, and, most strikingly, E. M. Barry's Royal Opera House built just inside Valletta's City Gate, all helped establish the neo-classical style in Malta as the expression of empire. 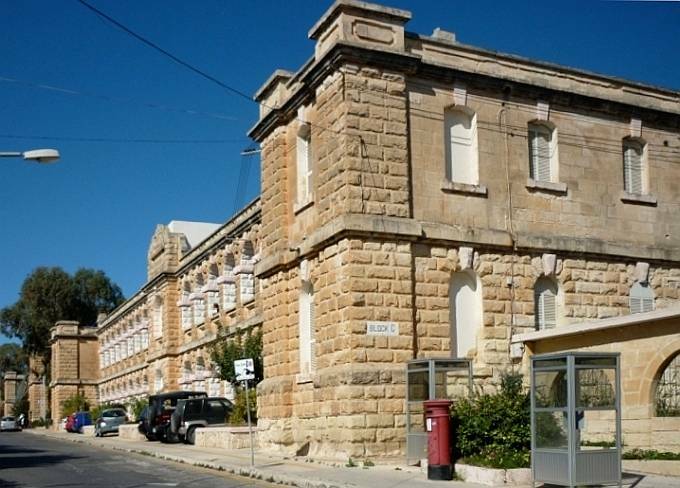 New institutions, like the Royal Naval Hospital on a promontory overlooking the Grand Harbour, completed in 1832, and the Lunatic Asylum at Attard, completed in 1861, were also built on neo-classical principles, with colonnades, porticos and symmetrical blocks and wings (see Malcolm Borg 78). The impact on Maltese architectural style in general was rather limited, but still significant. 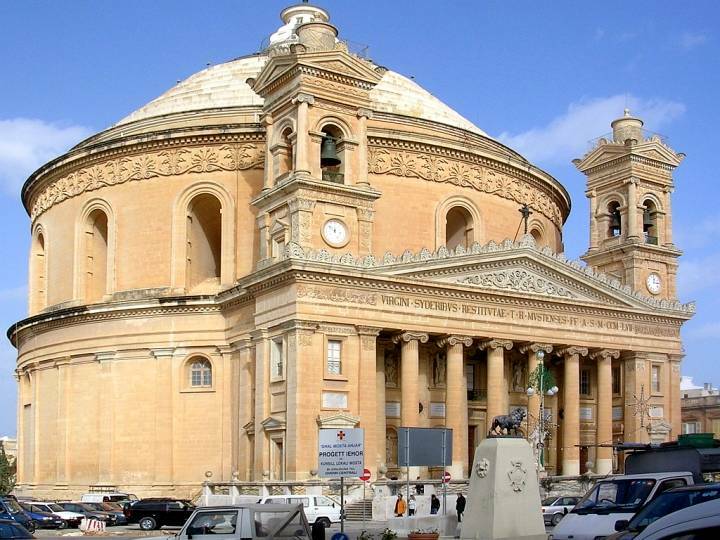 The cornerstone of the Mosta Dome, Malta's "dominant Neoclassical building" was laid as early as 1833 (Victor Borg). Known more properly as the Rotunda of St Marija Assunta, this is a parish church of astounding proportions. Built by the parishioners themselves to the design of Giorgio Grognet de Vasse, it was influenced by the Pantheon, and has an enormous world-class rotunda. It was not completed until 1860 (see Scerri). Then, as the new administration became established and was taken for granted, other trends appeared. A fresh wave of "old" influence brought the neo-Gothic. Barry's Clerk of Works was Lincolnshire-born Webster Paulson, who went on to become Clerk of Works to Malta's gifted Chief Architect under the British, Emmanuele Galizia. 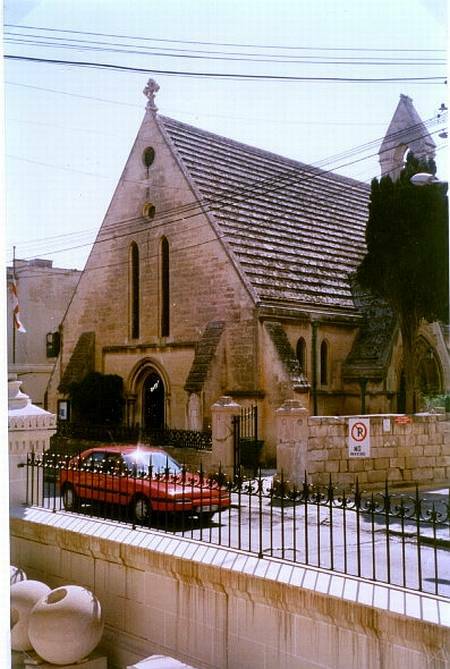 Paulson was much involved in the building of Holy Trinity Anglican Church, Rudolph Street, Sliema, later in the 1860s. This church has a steeply pitched roof and a quaint bell cote, making it look exactly like a parish church in an English village. It is more disconcerting to see Roman Catholic churches in Malta with pointed elements. Two examples of Galizia's work in the Gothic style are the Carmelite Church in Balluta Bay and Our Lady of Lourdes in Mgarr Harbour, Gozo, though his masterpiece is considered to be the earlier church at the Addolorata Cemetery in Paolo. 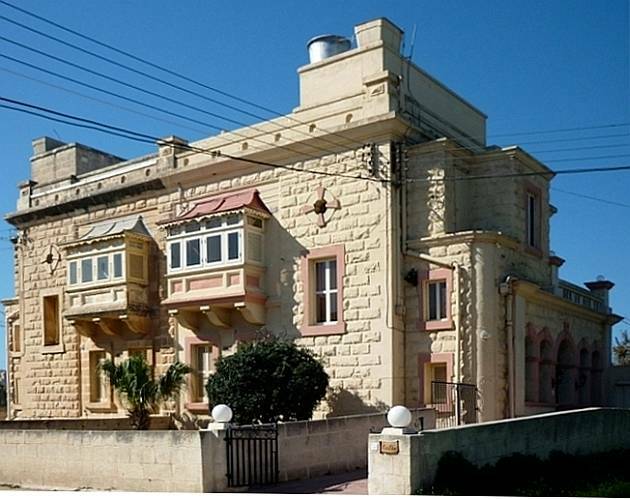 Interestingly, Galizia exhibited another fashionable trend in Victorian architecture in Malta: having designed the Turkish Cemetery in Marsa in 1874, and travelled widely not only to Cyprus but also to North Africa and even Egypt (see Malcolm Borg 93), he built a small but eye-catching complex of Moorish residences in Sliema, where wealthy people from Valletta liked to spend the hot summers. 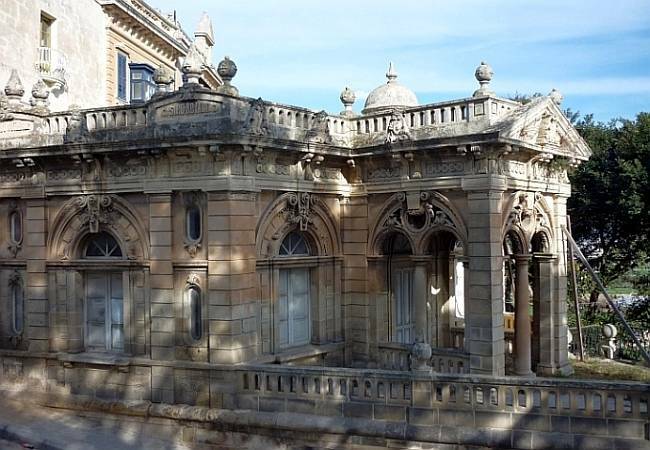 (a) Partial view of Webster Paulson's Casino Notabile, Saqqajja Hill, Rabat, of 1887; note that the building is supported by wooden props, because it is in urgent need of restoration. (b) Officer's villa at St Andrew's, Pembroke, with a fine mix of Maltese and English design ideas. (c) Semi-detached houses with traditional-style balconies at St Andrew's. 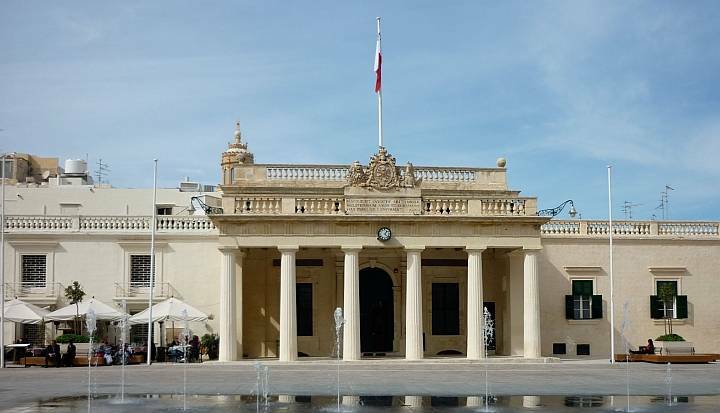 Of special interest are structures built by the British but clearly influenced by Maltese taste. An example is Paulson's small but exuberantly decorative Casino Notabile in Rabat, built on the site of an old wash-house, and designed for social gatherings. In the later part of the century, too, the unknown architect-engineers of Fort Pembroke's military complex at St Andrew's were also guided by local taste, producing villas built with terraces, verandas and balconies for the officers there. 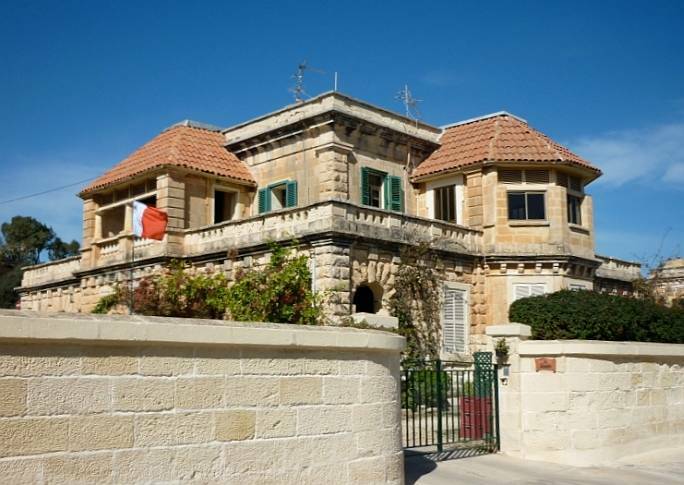 The "eclectic mix of British, colonial and local styles" has been much praised, and their workmanship has been seen as "a credit to the architects and Maltese masons" ("Officer's Villas and residences"). They certainly blend well with, and add interest to, the nearby barracks. The first of these barracks were built in 1850; the last British soldiers left only in 1979 (see "Places of Interest"). Block C of the barracks at St Andrew's, a familiar kind of colonial structure but looking bright and open as well as sturdy, thanks to the use of local limestone and the white paintwork on the inner surfaces of the arches. Note the familiar red pillar-box on the corner, one of the "amenities" introduced by the Victorians. Industrial architecture represented yet another trend. Introduced by Scamp at the old naval bakery, with its innovatory use of iron and engineering techniques, it produced the important, Grade 1-listed Covered Market at Valletta, also supervised by Scamp, which used vast amounts of cast and wrought iron and is still in operation today. Urban planning, and the landscaping of gardens and out-of-town cemeteries like Galizia's Ta' Braxia cemetery in Pièta, with its chapel by J. L. Pearson, are other distinct areas in which Victorians' influence can be felt, while Valletta's monumental Victoria Gate, designed by Galizia again, left no doubt about their presence during the country's emergence into the modern world. Left: A stretch of the pre-British Wignacourt aqueduct, to which more water was supplied in Victorian times; it is no longer in use. Right: An unusual sight in Malta: a railway tunnel for the old line from Valletta to Mdina; the route can still be seen though there are no tracks now. The Victorians' biggest projects were in the area of civil engineering, and here their most immediately useful contribution was to the water supply, in a country where, as Coleridge had noted, "no regular streams are to be met with" (see Part 1 of this series). 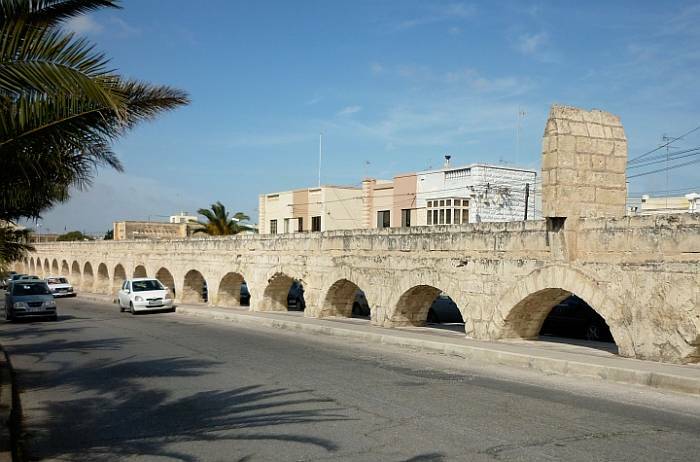 After several dry years, they constructed the new Fawwara aqueduct; later, they greatly boosted the output of the seventeenth-century Wignacourt aqueduct, by sinking shafts and driving galleries into the limestone in 1864-6, to draw up more water for it. The provision of potable water was terribly important in an era of epidemics, which swept the country from time to time much as they did in Victorian England: there was a cholera outbreak as late as 1887. Irrigation was another important area of progress: Chadwick Lakes, a system of dams to collect rainwater, were constructed in the 1880s, and named after the Consulting Engineer, Osbert Chadwick. Later, in 1888, a Water Distilling Station was built at Sliema as part of a larger sewerage system designed by Captain T. J. Tresidder of the Royal Engineers, who had written a report on "Sanitation for Sliema" in 1884. 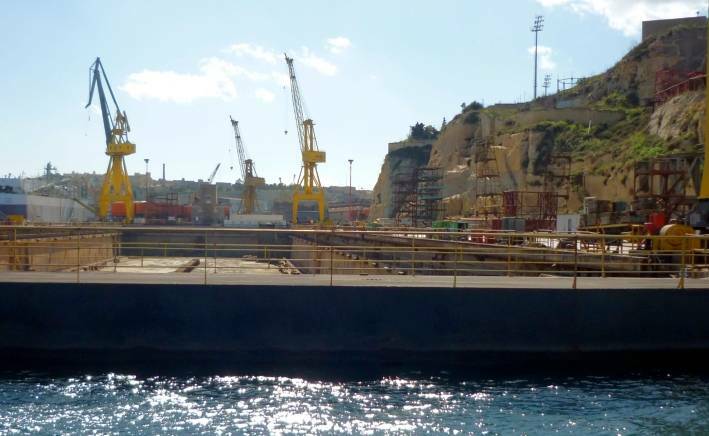 Left: One of the dry docks in the Grand Harbour, which made it such an important resource for the Mediterranean Fleet. Right: Harbour mouth and breakwater for the extended Grand Harbour. During the 1880s too some of the other "amenities of late Victorian civilisation" were imported, not only for sanitation, but also for housing and communications (Hughes 248). In 1890, a domestic water supply was finally introduced (see Mallia-Milanes 105), and electric street lighting was introduced in this period too. But the fruits of all these developments were slow to reach the villages, and not all the Victorians' projects proved their worth. A railway from Valletta to the old capital of Mdina was inaugurated in 1883, only to be closed down in 1890, reopened and finally closed down again in 1931 (Azzopardi). Some signs of it remain today. 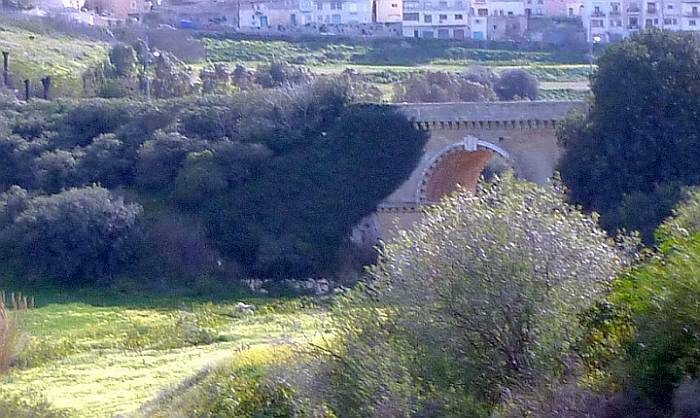 For example, the Notabile station can still be seen below Saqqajja Hill, and a nineteenth-century railway tunnel shows how the track went into Mdina. It looks quaintly incongruous in countryside where buses are the only means of public transport. Left: The Clock Tower at Fort Pembroke, added in 1903. Right: A section of the Victoria Lines, with thanks to Rolf Krahl at Wikimedia Commons. Other major work was naval and military in nature. Improvements to the harbour continued throughout the period. The first British Admiralty dry dock was opened in 1848 (Tagliafero 76). More such facilities were added, and William Scamp's plans for extending the harbour and quay were carried through before his death in 1872 (Obituary 276). Lighthouses were constructed, too, to guide the ships in safely. 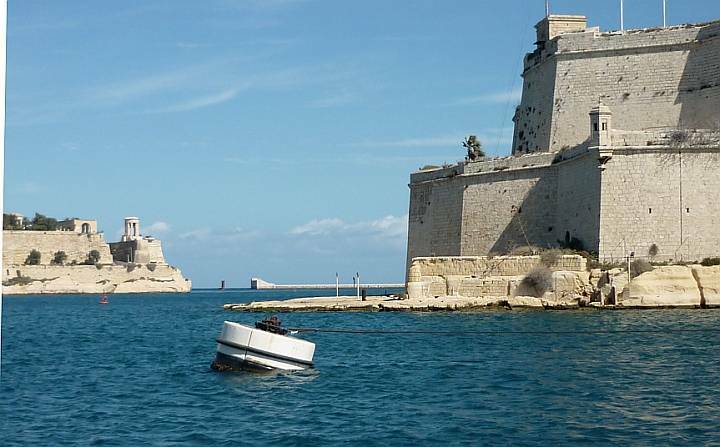 Most remarkable, however, was the strengthening of the island's already formidable fortifications. 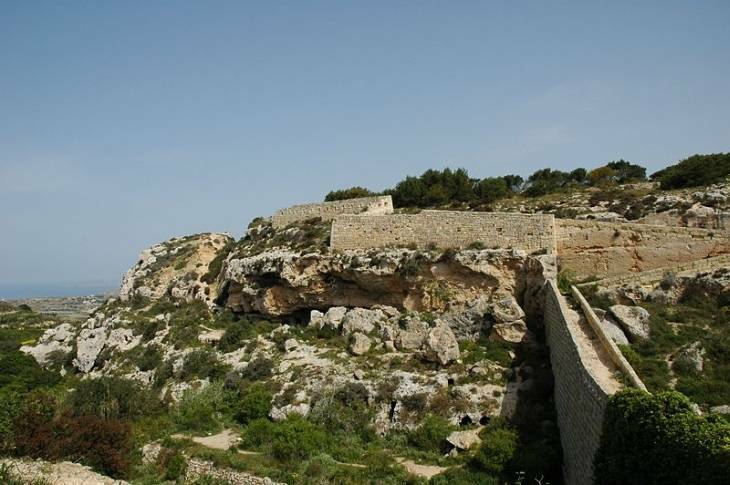 The defence potential of the Great Fault, which crosses the island from east to west, had long been recognised, but from 1875 the British added three forts: Fort Madalena at the eastern end, Fort Bingemma at the western end, and Fort Mosta in the centre. In the centre too they constructed a new entrenchment, known as the Dwejra Lines. All these were linked together in the 1890s by a stout wall running along the top of the ridge, with fortified bridges linking it over the valleys, and various gun emplacements and battery posts along the way (see Grech 82). Fort Pembroke, its residential buildings at St Andrew's already illustrated above, was built overlooking the coastal approach, for the extra protection of the Grand Harbour (see Stephenson 37). In 1897, in honour of the Queen's diamond jubilee, this whole impressive collection of fortifications was named the Victoria Lines. Azzopardi, N. "The Malta Railway." Viewed 7 April 2010. Borg, Malcolm. British Colonial Architecture in Malta, 1800-1900. San Gwann: Publishers Enterprises Group, Malta: 2001. Borg, Victor Paul. "Development of Maltese Architecture." Link updated 5 June 2016. "History (Villa Bighi)". Malta Council for Science and Technology site. Link updated 5 June 2016. Hughes, Quentin. 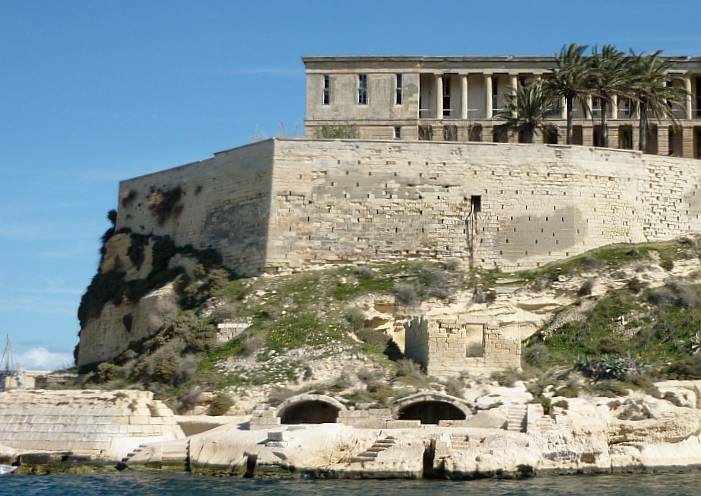 Fortress: Architecture and Military History in Malta. London: Lund Humphries, 1969. Mallia-Milanes, Victor. The British Colonial Experience, 1800-1964: The Impact on Maltese Society. Msida, Malta: Mireva, 1988. Obituary of William Scamp. Proceedings of ICE (Institution of Civil Engineers). Vol. 36: 273-8. "Officer's villas and residences, St Andrew's military complex." The Times of Malta, 23 Feb. 2010, p. 12. "Places of Interest." Pembroke Local Council site, Malta. Viewed 7 April 2010. Stephenson, Charles, with illustrator Steve Noon. The Fortifications of Malta, 1530-1945. Oxford: Osprey, 2004.